Facing the main business area, of the Shire with typical industry in the background, Grant Reserve is in a central position in Civic Parade which links east and west residential Altona. Altona has every cause to be proud of Grant Reserve, no other Victorian municipality has Its Civic offices centred in so an imposing setting. The more modest Altona structures, in a most significant way, compliment their situation. In the park area of 70 acres the eye is held by the Civic office complex, which in fact covers but a small proportion. Development to the rear is so distant as not to obtrude. The admirable sporting areas give an air of spaciousness and further help to emphasise the Civic Centre. 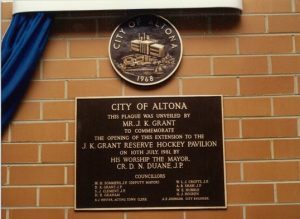 Grant Reserve was the backdrop for one of Altona’s greatest ceremonies, the proclamation of the City of Altona, 1968. Adjoining Grant Reserve is the Cherry Lake area. Here is a further 250 acres of open space which, though under the control of the Board of Works, is essentially an extension of the Reserve. The Reserve is named after an earlier councillor, John Kenneth Godfrey Grant, the Reserve is a sporting area par excellence. John Grant was born in the area and grow up in Altona. He was an early member of the Altona Hockey Club (playing goalie) and continued contributing to the club in later years as Club Patron. The Hockey Club fields and rooms are situated at the Northwest end of J.K. Grant Reserve. John was born in February 1910 to Donald Alexander Grant and Alice Matilda Carroll. At the time Donald and the family were residing at the Truganina Explosives Reserve, Laverton where Donald was the Caretaker. 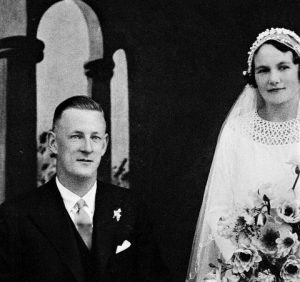 John married Gladys Winifred Fiddian in 1935 and the couple settled down in Seaview Crescent, Seaholme. John Kenneth Godfrey Grant always took an active role in the development of Altona, particularly in the era of rapid development after the war. John was elected to the Werribee Shire as the representative for the Altona riding in 1939. He was Shire President from 1942-1943, during which time he oversaw two war loan campaigns and he served on the Council for 12 years until resigning in 1951. In 1952 John and Gladys moved the family to Brighton Beach to facilitate the higher education of their children. John Kenneth Godfrey Grant passed away in October 1983.